This was one of the very first recipes I posted. I haven't made it in ages, but today I had a little craving. Lately food never sounds good to me, so when something does...I don't let the feeling pass me by. It also happens to be a perfect "soup" day here in Utah. I first discovered this recipe while pregnant with Reese. It quickly became a comfort favorite. Funny I should be craving it again while pregnant. 1. Heat olive oil in a heavy, large pot over medium heat. Add the leeks and the garlic and stir. Add the potatoes and cook for 5 minutes, stirring often. Add the artichokes, stock, salt, and pepper and cook until the vegetables are tender, about 20 minutes. 2. 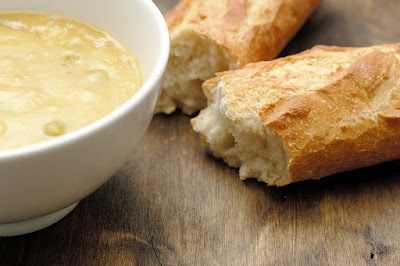 Using a handheld immersion blender, or in a blender in batches*, puree the soup. Add the 1/4 cup cream cheese and blend again to combine. 3. Ladle the soup into serving bowls. Top with chives to garnish (optional). It looks absolutely lovely. A restaurant in my area offers one that similar, but their version uses carrots which makes the dish too sweet.